For 10 years Serzh Sargsyan was president of Armenia. He initiated changes to the Constitution which made Armenia become a Parliamentary Republic. According to the amendments the president would be majorly stripped of his powers and the main post in the government would be prime-minister which should be elected by the majority of the parliament. Sargsyan assured his people that he will not run for the post of president or prime-minister after his second term ends. This year he broke his promise. On the 17th of April 2018 he ran as the only candidate for prime-minister and was voted in by 77 out of 105 representatives. This event has met major spontaneous protests in Erevan, the capital of Armenia. People fear that Sargsyan has usurped power, since prime-minister can be reelected any number of times. 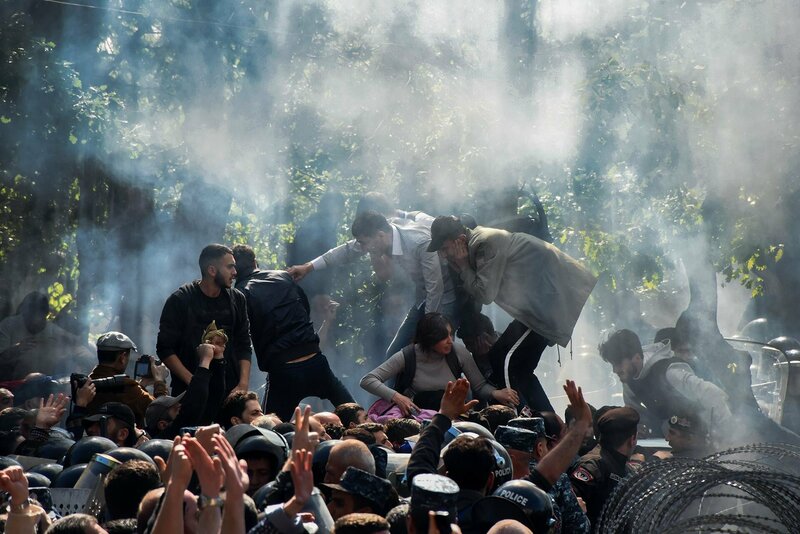 The opposition leader Nikol Pashinyan has called for “demonstration of civil disobedience”. He announced his actions as the start of Armenian “velvet revolution” and has emphasized the revolution should be peaceful and that participants must not use violence. People participating in the demonstration have paralyzed traffic in the city by blocking roads and metro stations. Pashinyan has also called for people to start blocking entrances to government buildings. The police have deemed these actions illegal and aims at dissolving demonstrations. They started using “noise-grenades” on the people. So far, the government reported 100 people detained due to demonstration. It was also reported that over 40 people were injured, among them 6 policemen. All the government buildings are now circled by riot police. So far the activists plan to continue demonstration, however it has been reported that less people participated today than previous days. Correct me if I'm wrong, it is not the first demonstration against him. Something like 5 years ago people were not happy for him going on a second term. As for "revolution", unfortunately such events doesn't go well in post soviet countries. In all previous cases new government was way worse than the previous one. You are right about the demonstrations. There was a number of big protests in Armenia in the past, none of which brought any significant changes. As for revolutions, generally I agree with your point and understand your skepticism. However I can bring up the Rose Revolution in Georgia as an exception to the rule. Rose Revolution brought peaceful transfer of power. The people who came into power after that practically eradicated corruption in the state. They liberalized the economy, and as a result of their policies their GDP went up 300%. Do you have good sources for this ongoing situation? Cool. I wanted to start reading up on it. I do not read Russian. I'll check it out. I'm sure some of my normal sources for Eastern Europe will do some summaries also.